8000 Feet and Counting: ¡Por eso es que hoy tenemos esperanza! Last Wednesday, the 24th of August, The Government of Colombia and the FARC (Revolutionary Armed Forces of Colombia) announced that they had reached the conclusion of their negotiations and the peace accords were ready to be signed. This is such an exciting time for Colombia, especially to be here accompanying the people who are working for peace! After more than 50 years of armed conflict between the government and the FARC, and now, after four years of negotiating, the country is ready to take a giant step towards peace. The work of the churches in supporting this has been crucial, and will continue to be as the country struggles for the full implementation of the agreements. 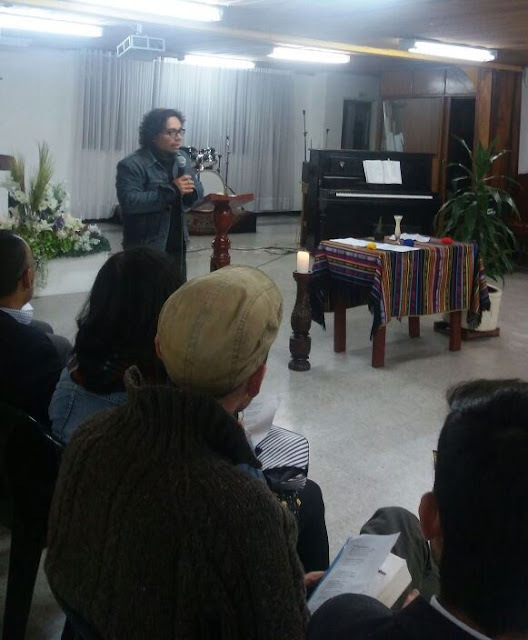 In fact, DIPAZ, the Inter-Church Dialogue for Peace, which the Lutheran Church of Colombia is a member, has been very involved in pressing the negotiating teams to keep at it, and was even mentioned by name in the final agreement document! In an atmosphere full of hope we understood this achievement as “good news” that will lead to the transformation of the conflict in Colombia. Here is the official declaration from DIPAZ after hearing the announcement. Mennonite church in Bogota. Photo by DIPAZ. Sermon on the Mount and "Blessed be the peacemakers..."
The next step in this process comes on October 2 of this year. A plebiscite will be held for the citizens to vote “yes” or “no” on whether or not they accept the agreement between the government and the FARC, legally mandating all future administrations to implement it. There was a lot of celebration in the air here in Bogota on the night of the 24th, as well as all over Colombia. This article from the Colombian newspaper, El Tiempo, shows many photos of the joy and celebration. For those who read Spanish, here is the complete text (297 pages) of the final agreement. A lot of difficult, yet exciting, work ahead as the IELCO continues to define and act on its role as an actor for peace and justice in Colombian society.